^ Chris Murphy on Twitter. Twitter. [2018-10-08]. （原始内容存档于2018-10-08） （英语）. ^ 2.0 2.1 Jamal Khashoggi: Turkey says journalist was murdered in Saudi consulate. BBC News. 2018-10-07 [2018-10-09]. （原始内容存档于2018-10-09）. ^ Speakers. International Public Relations Association - Gulf Chapter (IPRA-GC). 2012 [2012-05-10]. （原始内容存档于2012-05-11）. ^ 4.0 4.1 沙國打破沉默 證實記者卡舒吉已死 18人涉案. 聯合新聞網. 2018-10-20. ^ Who Is Jamal Khashoggi? A Saudi Insider Who Became an Exiled Critic. Bloomberg. 2018-10-10 （美国英语）. ^ For Khashoggi, a Tangled Mix of Royal Service and Islamist Sympathies. New York Times. 2018-10-14 （美国英语）. ^ Smith, Gina. Donald Trump Once Bought A $200M Yacht from Jamal Khashoggi’s Famed Arms Dealer Uncle [exclusive]. aNewDomain. [2018-10-14] （美国英语）. ^ Who is Jamal Khashoggi?. VOA. 2018-10-12 [2018-10-12] （美国英语）. ^ Jamal Khashoggi, der Unbequeme. SZ. 2018-10-11 [2018-10-14] （德语）. ^ Philippe Martinat. 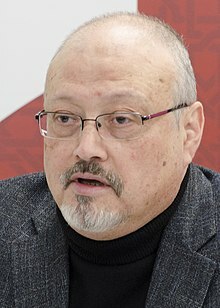 Disparition du journaliste saoudien Jamal Khashoggi, le mystère demeure. leparisien.fr. 2018-10-10 [2018-10-22] （法语）. ^ 11.0 11.1 Jamal Khashoggi: Who is missing Saudi Journalist?. BBC News. 2018-10-08 [2018-10-09]. （原始内容存档于2018-10-09）. ^ Obituary: Jamal Khashoggi was a 'good man and a fine journalist'. Al Jazeera. 2018-10-20. ^ Opinion - Saudi Arabia wasn’t always this repressive. Now it’s unbearable.. Washington Post. [2018-10-07]. （原始内容存档于2018-10-06）. ^ Turkey says journalist Khashoggi 'killed at Saudi consulate'. France 24. 2018-10-07 [2018-10-09]. （原始内容存档于2018-10-09）. ^ Prengel, Kate. Hatice Cengiz, Jamal Khashoggi’s Fiancee: 5 Fast Facts You Need to Know. Heavy.com. 2018-10-12 [2018-10-20] （美国英语）. ^ 谍海悬疑奇案 沙特记者进使馆后人间蒸发. BBC中文網. 2018-10-11. ^ 在沙特领馆离奇失踪的记者：土耳其称已被分尸 特朗普扬言制裁. BBC中文網. 2018-10-14. ^ Turkish police believe Saudi journalist Khashoggi was killed at consulate, sources say. DailySabah. [2018-10-07]. （原始内容存档于2018-10-07）. ^ Coskun, Orhan. Exclusive: Turkish police believe Saudi journalist Khashoggi was.... U.S. [2018-10-07]. （原始内容存档于2018-10-07） （英语）. ^ Turkish police suspect Saudi journalist Khashoggi was killed at consulate. Middle East Eye. [2018-10-07]. （原始内容存档于2018-10-07） （英语）. ^ Turkish police believe Saudi journalist Jamal Khashoggi was killed at consulate: Sources, Middle East News & Top Stories - The Straits Times. archive.org. 2018-10-06 [2018-10-07]. ^ Turkey concludes Saudi journalist Jamal Khashoggi killed by ‘murder’ team, sources say. Washington Post. [2018-10-07]. （原始内容存档于2018-10-07） （英语）. ^ Jamal Khashoggi: Turkey concludes Saudi journalist killed by ‘murder’ team, sources say - The Washington Post. archive.org. 2018-10-06 [2018-10-07]. ^ Saudi journalist 'killed inside consulate' – Turkish sources - World news - The Guardian. archive.org. 2018-10-06 [2018-10-07]. ^ 25.0 25.1 Turkish police suspect Saudi journalist Khashoggi was killed at consulate. Middle East Eye. [2018-10-07]. （原始内容存档于2018-10-07） （英语）. ^ Missing journalist Jamal Khashoggi 'was killed inside Saudi consulate'. Sky News. [2018-10-07]. （原始内容存档于2018-10-07） （英国英语）. ^ Turkey concludes Saudi journalist killed by ‘murder’ team, sources say. South China Morning Post. [2018-10-07]. （原始内容存档于2018-10-06） （英语）. ^ 指異見記者遭特工分屍 土官︰沙地王室下暗殺令. 蘋果日報. 2018-10-11. ^ Jamal Khashoggi: Turkey to search Saudi consulate. BBC News. 2018-10-09 [2018-10-10]. （原始内容存档于2018-10-10）. ^ 30.0 30.1 30.2 30.3 沙特记者失踪 土耳其调查人员将搜查沙特领事馆. 美國之音. 2018-10-10 [2018-10-10]. （原始内容存档于2018-10-10）. ^ Khashoggi case: CCTV disappears from Saudi consulate in Turkey. The Guardian. 2018-10-10. ^ 32.0 32.1 特朗普对失踪沙特记者命运表示悲观，苹果手表记录案情？. 美國之音. 2018-10-14. ^ 15-member Saudi 'intel squad' sent to target WP's Khashoggi identified. Daily Sabah. 2018-10-10 [2018-10-20]. ^ 土耳其公布卡舒吉失踪前夕抵土的沙特人名单及照片. 半島電視台中文網. 2018-10-10 [2018-10-20]. ^ 36.0 36.1 36.2 36.3 36.4 Khashoggi case: Report links suspects to Saudi prince. The Straits Times. 2018-10-18. ^ Matheson, Rob. Who are the Saudi suspects in the Khashoggi case. Al Jazeera English. 2018-10-17. ^ McKernan, Bethan. Jamal Khashoggi: US secretary of state meets Saudi king for crisis talks. The Guardian. 2018-10-16. ^ 蓬佩奥会晤沙特外长 讨论失踪记者卡舒吉事件. 美國之音. 2018-10-16. ^ 52.0 52.1 包雪琳. 记者“失踪”多方关切 沙特同意土搜查领事馆. 新华网. 新华社. [2018-12-12]. ^ 54.0 54.1 沙特记者失踪事件：官媒称卡舒吉“在冲突后身亡”. BBC News 中文. 2018-10-20 [2018-12-13] （英国英语）. Visual guide on Jamal disappearance on The Guardian.